Christian was not just well-liked by the audience, but within the game. He was the unlikeliest of “Brochachos.” He even gave us some incredibly memorable conversations with “The Mayor of Slamtown” as to how this fictional city might be ran. His confessionals were always pure gold. His authenticity rubbed off too on his fellow cast-mates. In fact, it took 18 total votes to finally bring him down. He would have been gone a long time ago if not for his allies in the game, who worked incredibly hard and even used some of their advantages in the game to propel Christian forward. But knowing how charming he was, Christian became a bigger and bigger target the more it dawned on the others that there was no way they could win against him…the ultimate Survivor compliment. Many players took swings to knock him out of the game, only to find themselves getting their torches snuffed. The most shocking of all was when Christian’s closest ally, Gabby, betrayed him just last week, but fell short herself. His “nine lives” in the game were finally set to expire though. 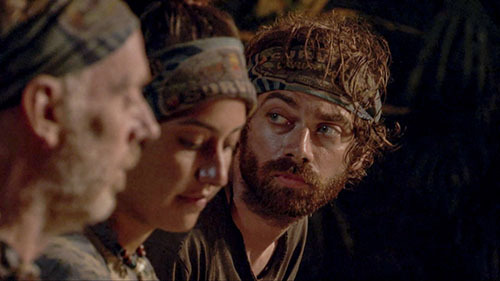 When Mike – who also was aligned with Christian for a time – enthusiastically persuaded the others left in the game that the time was now to get rid of him. 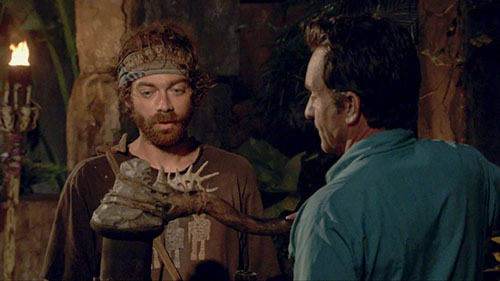 It only took three votes ultimately, and Professor Hubicki became the seventh member of the jury and the last contestant to exit the game ahead of next week’s two-hour Finale Episode. Christian Hubicki: Well that’s a really flattering prospect (laughs). I’m not sure I can accept that, but let’s go with the premise. I do feel really well-received and really pleased with how people have liked me on the show, which is really great! I didn’t go out there to pretend to be anybody but myself. So to go out there and be what you believe is “yourself,” and have people like it, I mean, what more flattering compliment is there? Christian: So we were tight for a long time. Especially after that Jess vote, the second vote of the season, that was really great and established a great deal of trust. We also made sure that we kept each other at a distance after the merge, that way people wouldn’t see that we were together. That’s probably why people tipped off Nick, thinking he wasn’t close to me, when they tried to vote me out the first time…I think though in that distance, I became ACTUALLY distant from Nick. That’s sort of the trap of that sort of alliance. But also, the way that Mason-Dixon formed, I was always a bit suspicious. In that he came up to me within the first hour of the game saying hey, I’m like J.T. and you’re like Stephen Fishbach, let’s go to the Final Two, let’s go to the finals together! It was like hour one of the game, so you know that that can’t be sincere at that point. So even though we had built real trust, there was always that part of me that was like, Nick is not going to look out for me in the long-run. For much more from Christian Hubicki, including my full interview, please listen to the latest episode of the FilmSurvivor Podcast by clicking here. Remember! 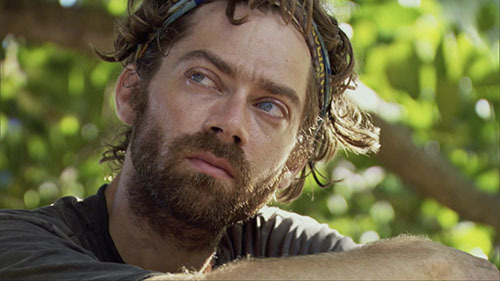 The two-hour FINALE episode of Survivor: David vs. Goliath is next Wednesday, and be sure to check back here for my recap and reaction Wednesday night! 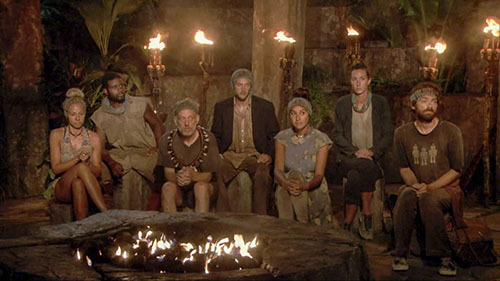 Then next Thursday it’s a mega-sized edition of the Podcast, where I’ll be speaking with all six remaining contestants, including the Sole Survivor of David vs. Goliath…and we’ll look ahead to Season 38 starting in Feb 2019! 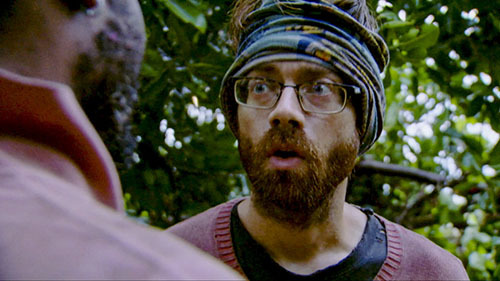 TELL US: WHAT DO YOU THINK ABOUT CHRISTIAN’S EXIT FROM SURVIVOR?